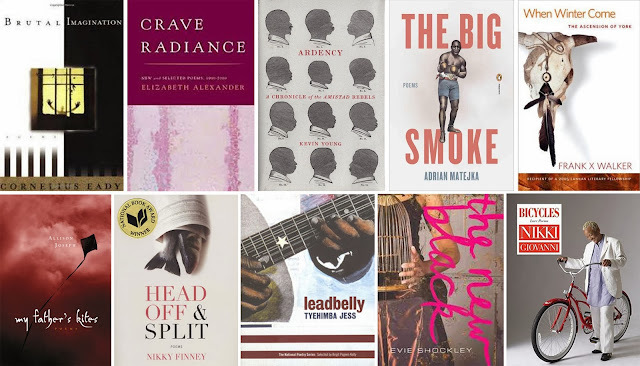 • January 2: C. Liegh McInnis's rapid pace across "The Bridge"
• April 19: Notes on "Beyond Poet Voice"
• March 6: Amiri Baraka's "Dope" and June Jordan's "Poem about My Rights"
• August 30: How do we get from Gwendolyn Brooks to Mahogany L. Browne? • June 27: Can the sounds of black women's poetic voices get a witness? • May 24: When will poets & literary scholars deal with gun violence? • November 7: The extraordinary ambition of Robin Coste Lewis's "Voyage of the Sable Venus"
• October 31: Remixing Kelly Norman Ellis's "Raised by Women"
• September 9: Amiri Baraka on those Albert Ayler "ruins" and "rumors"
• August 31: Returning, yet again, to Reginald Harris's "The Lost Boys"
• May 25: Poetry and "Basquiat: The Unknown Notebooks"
• May 12: Digital Creativity: Tyehimba Jess's "Another Man Done"
• March 30: A senior African American poetry scholar as blogger: The Case of Jerry W. Ward, Jr.
• March 15: Drawing Connections, Reading Reginald Harris's "The Lost Boys"
• March 13: Claudia Rankine's Citizen becomes a "first"
• February 28: What it's like reading just one poem? • June 4: When did contemporary black poetry begin? • March 16: Are contemporary black women poets more likely than men to write sonnets? • February 13: A 1960s/70s Poetry Puzzle: How to make poems black and blacker? • January 3: What if poets published sequels? • December 11: Do black men and women college students respond differently to poetry? • November 25: Poetry awards as "megablurbs"
• July 30: Poets against poetry? • July 5: Does the Pulitzer award for poetry favor "younger" black poets? • June 15: Why are all the black poets sitting together over there? • June 8: Marking up Paul Laurence Dunbar's "We Wear the Mask"
• April 14: The hues of Hughes, the dynamism of D.A.S.H. • April 9: Could some black poets benefit from Illuminati accusations? • March 7: Favored black poets don't have to be "the best"
• January 20: Poetry projects: Digital Humanities or Afrofuturism? • January 15: Who else purchases volumes of poetry? • January 1: Django Unchained & Robert Hayden's "Runagate Runagate"
• December 17: What if African American poetry enthusiasts were like rap geniuses? • December 17: Too much or not enough African American poetry? • December 10: What if poets, taking a signal from Jay-Z, "decoded" their works? • December 5: Notes on the History of the term "Black Aesthetic"
• November 21: A growing distance between poets and readers? • November 18: What if there was a weekly New Volume of Poetry Day? • September 24: Which black poets appear most frequently in "the best" American Poetry series? • September 16: think black! • September 14: Does the Skin Color of Black Poets Matter? • July 9: Does the success of a few obscure the plight of many other black poets? • July 3: Lucille Clifton's "wishes for sons" & the trouble male students have saying "gynecologists"
• May 21: Ever Considered how Underfunded Spoken Word Poetry Is? • April 16: Why are some poets more popular than others? • April 4: Reading June Jordan's "Poem about My Rights"
• March 22: "When I grow up, I want to write poems." • February 22: Robert Hayden as a Black Arts (Era) Poet? • February 8: What Happens to Non-Award-Winning Poets? • December 7: Notes on Adrian Matejka's "Fisticuffs"
• November 29: Responses to Margaret Walker's "For My People"
• November 4: A Prelude to Rita Dove's Anthology? • October 13: Eric Ruckh & Jeffrey Skoblow Celebrate "Howl"
• August 13: When Black Poetry Isn't Written & Published, Does It Count? •July 17: Marking up Robert Hayden's "Frederick Douglass"
• July 14: "We Real Cool" & "For My People" First Appeared in Poetry Mag. • July 13: The Journey of Margaret Walker's "For My People"
• July 6: When Print, Performance & Online Cultures Converge: Amiri Baraka's "Dope"
• April 19: Memorizing Phillis Wheatley's "On Being Brought from Africa to America"
• April 18: Memorizing Robert Hayden's "Frederick Douglass"
• April 14: Rita Dove Addresses "Racist Selectivity"
• April 11: Memorizing Kelly Norman Ellis's "Raised by Women"
• April 2: How Public are Poets?